All 14 kids liked it, except the chicken. Only 3 kids ate the chicken. All 4 adults likes it with the chicken served over egg noodles, left out the frozen vegetables. Changed the onion powder to 1/4 C fine diced onion. Cindy, Thanks for the awesome feedback and we are happy to hear that this easy crock pot chicken recipe works well for you! Just made this! My family loves it. To cut the carbs, I omitted the carrots and noodles. Added more cream of chicken to make it more of a soupy consistency then shredded the chicken apart once it was done. It almost tastes like a chicken pot pie without the crust. I will try to add corn next time per my husbands request. 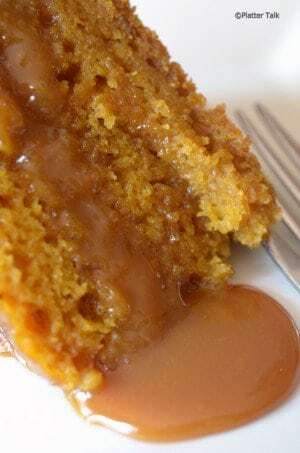 This was super easy and will definitely be making it again! Thank you. 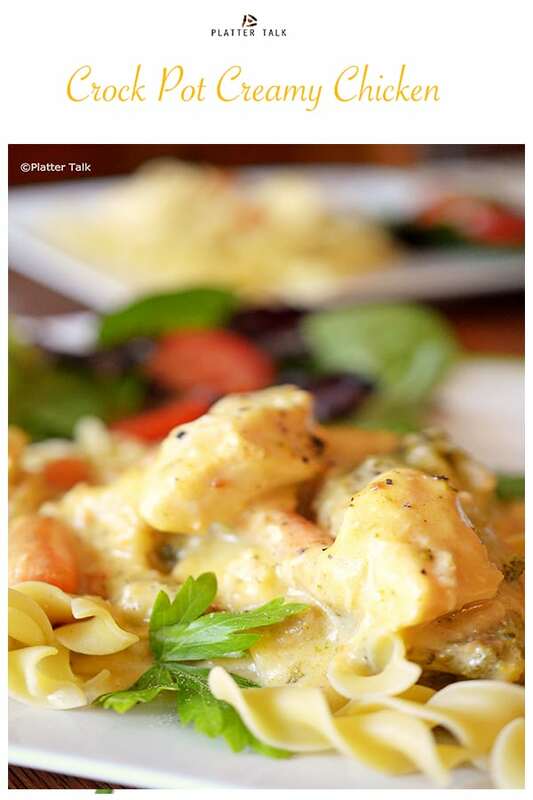 Thanks for the feedback on our creamy crockpot chicken recipe; sounds like you nailed it! I didn’t have time to wait for the slow cooker, so I made this in the oven tonight and it turned out great! It did take longer than 30 minutes to cook, more like 45. But I also used a Dutch oven so I’m not sure if that makes a difference or not? Other substitutions: I used one regular size can of cream of chicken, and one regular size can of cream of mushroom since that’s all I had. Chopped onions instead of using onion powder, and used fresh garlic. For veggies, I used broccoli. I’ll definitely make it again! Oh my god, this was so delicious and easy. As a single dad I’m always looking for dinner recipes I can throw together quickly. I added half a pack of onion soup mix instead of onion powder which added great flavor. Leftovers were even better the next day . My 8 year old son loved it and asked me to make it again. Thanks for the awesome feedback, Jake! 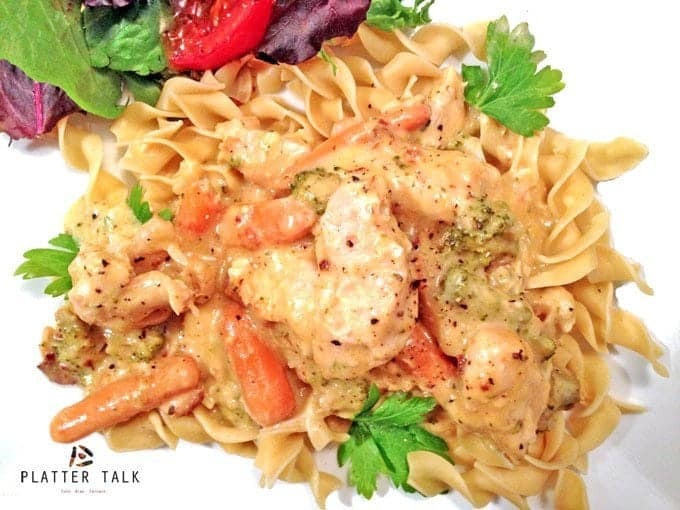 We are delighted that you and your son enjoy this easy crockpot chicken recipe! The onion soup mix sounds like a genius addition! 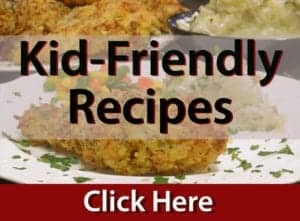 Can I use frozen chicken breasts? 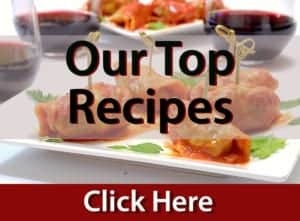 And if so how would I adjust the recipe? To help avoid foodborne illness, it is not advised to prepare frozen meats or other foods in a slow cooker. Alternatively, you can thaw them in the refrigerator or microwave prior to placing them in a slow cooker. 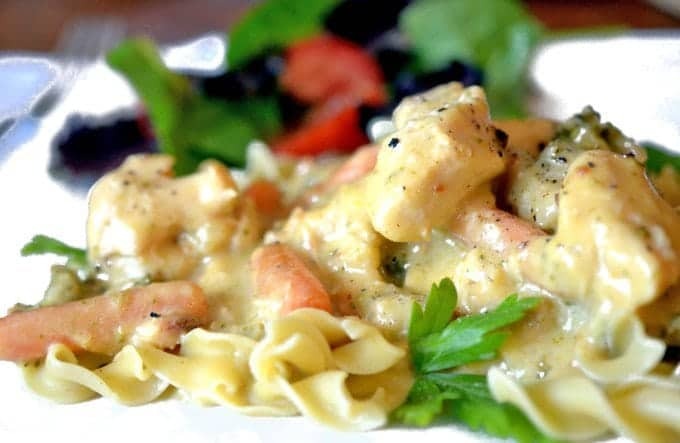 For this creamy crockpot chicken recipe as written, you should use 1 lb of chicken breast, if that is what you have on hand. Thanks for the question and thanks for reading Platter Talk! Going to try this out today but i had a question before i throw it all in the crockpot. I don’t have sour cream and don’t have a way to a store at the moment so i googled that mayonnaise can be substituted for sour cream but i wanted to ask first. Would mayonnaise be a good substitute in this recipe for the sour cream? Going to add potatoes and spinach for veggies and serve ontop of fried rice. 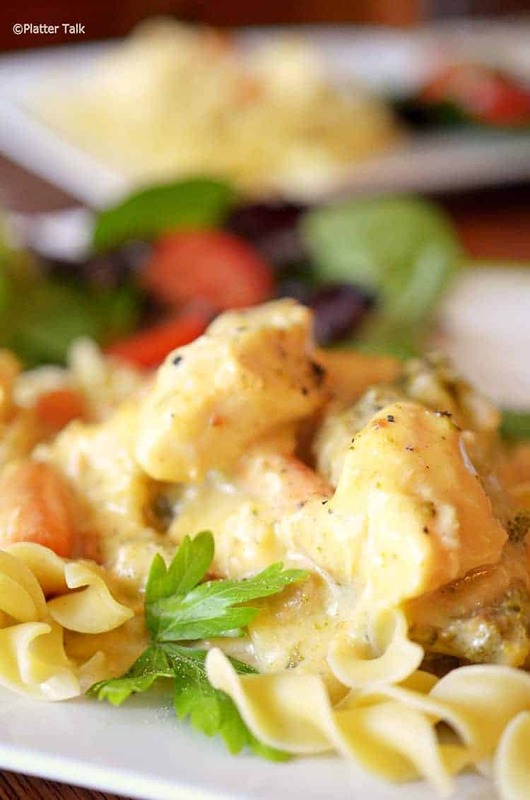 You could try mayonnaise with this creamy crock-pot chicken, but I would add it at the end. Good luck and thanks for the question! I used cream of mushroom soup instead because that’s what I had and chicken broth instead of the water. Potatoes and carrots for my veggies. So good. I’ll diffidently make it again. We loved it!!!! 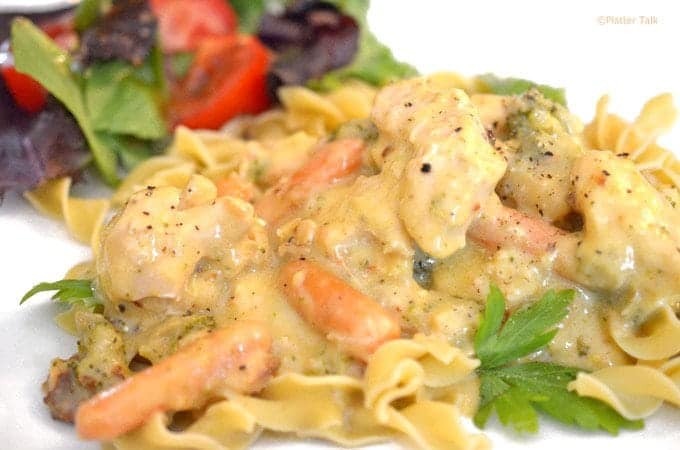 Great use of substitutions and sounds delicious; most of all we’re happy you enjoy this creamy chicken recipe!